You know how some women are shoe people, well I'm a jacket girl, and out of all the wardrobe staples biker jackets have to be my favorite. By now we all know you don't have to be on the back of a Harley to indulge in a tough-chic leather (or faux leather) motorcycle jacket. Styled simply with jeans and a tee, biker jackets complete a cool girl look and then juxtaposed with a feminine print or silhouette and it becomes an instant fashion statement. If you already have a basic black biker jacket in your closet try this season's quilted styles. The texture creates interest and softens the black leather. 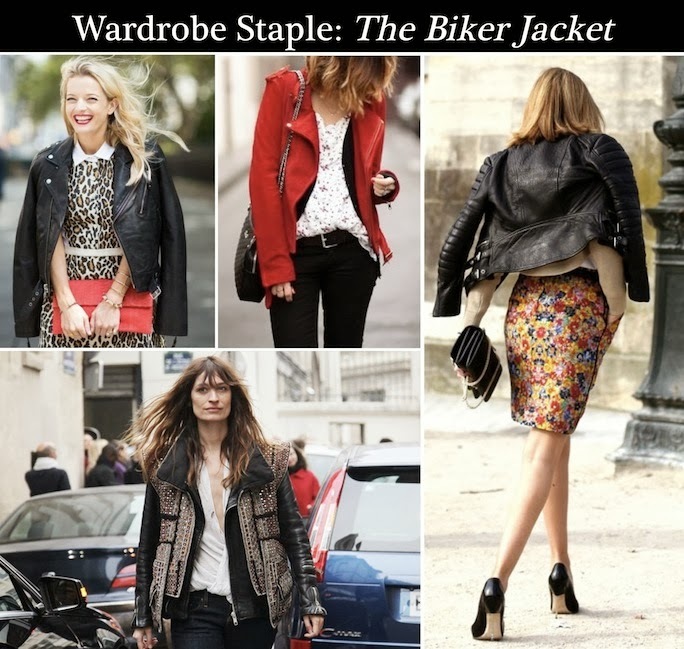 If you are ready to branch out, a colored biker jacket will serve your style well. I'm partial to oxblood color jackets - they are rich looking and act as an unexpected neutral. For trend hunters, a bright pop of cobalt or a red moto jacket work wonders to brighten up a dreary winter outfit. 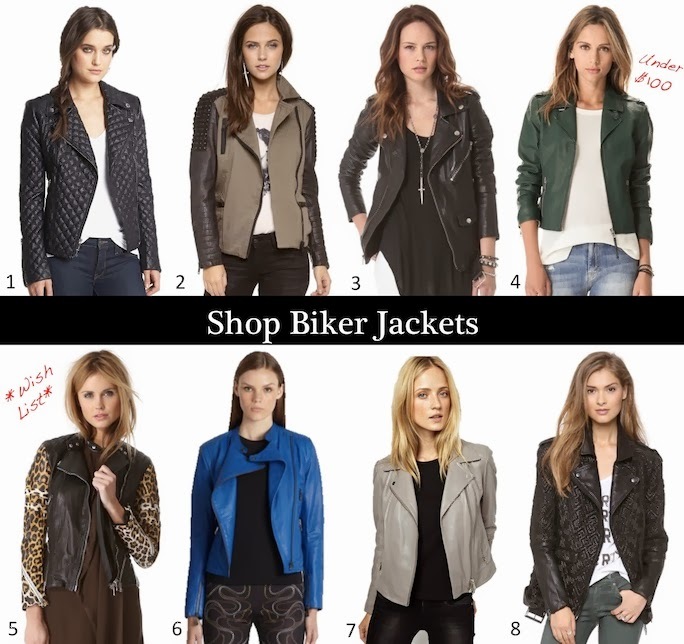 The hardest part about buying a biker jacket is choosing between all the styles out this fall. I'm a firm believer in investing in wardrobe staples, so if you don't already have one, spend a little more on something basic. Now is a great time for big purchases because for the next couple days Shopbop is having a 25% off sale with the code INTHEFAMILY25 and Saks is having a 25% off sale with the code FRNFAM. Definitely a must have for the fall. Love all of these jackets! They are so stylish. Obsessed with leather biker jackets- I have 2 so far! 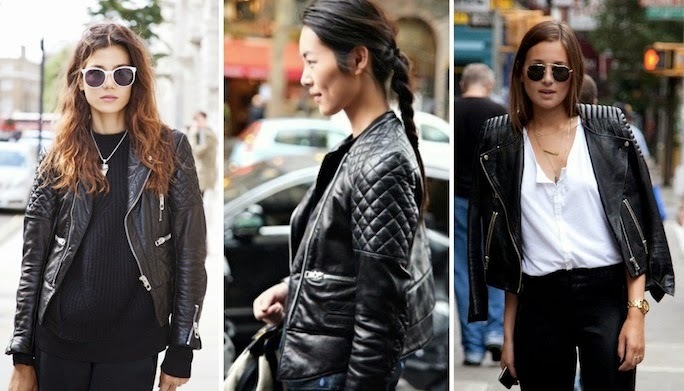 Obsessed with the leather biker jacket trend. I've been trying to find the perfect one to invest in - there are sooo many to choose from. It's a blessing and a curse. I need to get myself one of them jackets! ASAP! Great feature and blog! !